Near the end of the day yesterday, I finally had the hubs snap a photo of me for this challenge, but the I forgot to put it on the blog (oops!). So today you get to see two photos, one of me, and one of someone who inspires me: my grandma. 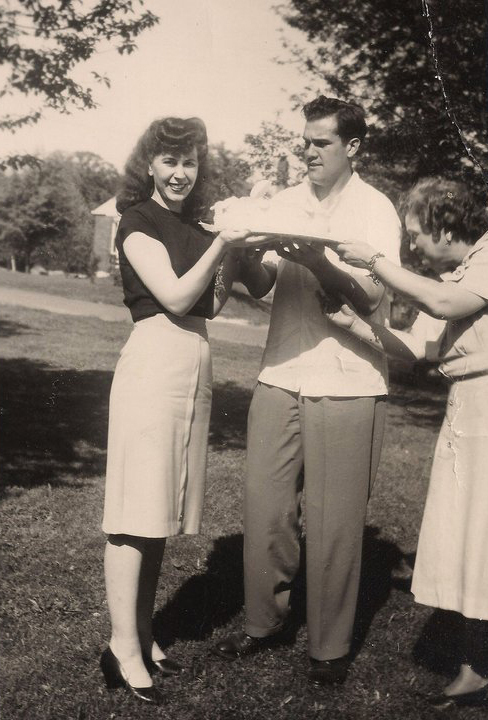 This photo, if I remember correctly, was my grandma and grandpa's wedding shower (he's the handsome guy in the white shirt). For her birthday last year, we dug up a bunch of old photos and had them blown up to decorate my mom's dining room as a surprise, and it was like walking around in a glamorous black-and-white movie. Grandma always had some cute outfit on, with her curly hair styled just right, and I often look at these photos on my computer when I need a little vintage inspiration. But her personality and demeanor are also utterly inspiring. She is, by far, the kindest person I know; she's always been someone who is eager to experience new things or learn something new; almost two years ago, she got out on the dance floor at my wedding reception and danced her big heart out, and I love her dearly for it; every time she comes over to our house, she beelines for the kitchen to do any dishes that (most likely) have piled up; she is an amazing cook, and I often credit her with my love of cooking, since the first thing I learned how to make was French toast in her kitchen; if anyone will hear the words, "Well done, good and faithful servant," it will be her; and she'll be the first person to laugh at herself when she says something weird. So grandma, thank you for giving me a picture of who I want to be when I grow up. I love you lots.